Reading for pleasure is at the heart of our school. We aim for every child to be reading for enjoyment throughout the whole of their school journey and for the rest of their lives. World Book Day allows us to celebrate our love for reading. 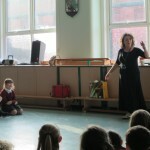 This year, we were lucky enough to have a visit from an author/illustrator-Charlotte Firmin. Charlotte is the daughter of Peter Firmin, the creator of Bagpuss and The Clangers. 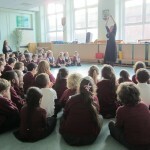 Each class from Nursery-Year 6 took part in an interactive storytelling workshop, where Charlotte encouraged the children to create a story whilst she illustrated it in front of them. 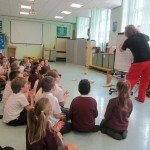 It was very inspirational and many children have already written their own stories, illustrating it to share with others! 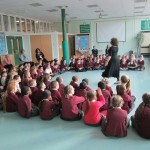 To celebrate National Storytelling Week 2015, Katrice Horsley worked with every child in the school, capturing their imaginations during exciting and engaging storytelling workshops. 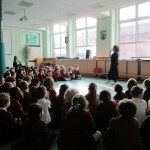 Every child was involved in the telling of the magical stories through actions and music. Walking around the school hearing the children retelling the stories to one another was fantastic! 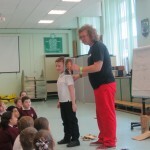 Craig Bradley a performance poet visited our school and had everyone in the room smiling and laughing at his creative poems. 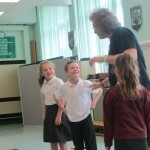 He included all children in his interactive sessions, showing that poetry is fun! All children were inspired by his poems- some children even began to write their own poems in the style of Craig Bradley. 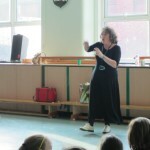 On World Book Day 2014, we were lucky enough to have a visit from the famous storyteller, Taffy Thomas MBE. 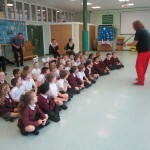 Every class in the school took part in a workshop where he wore his ‘tale coat’, which consisted of many scenes, all of which linked to a magical tale. 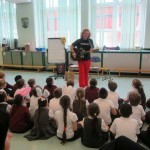 Adults and children alike were mesmerised by his tales. 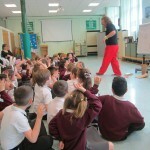 Some children bought a copy of his book and had a meet and greet session with Taffy where he signed their books. Taffy shared with everyone how there is no point knowing a story if it cannot be shared with others. What a truly inspiring day!